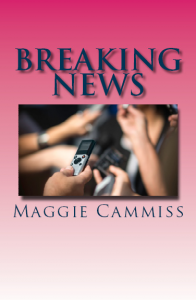 I’m delighted to welcome fellow author, Maggie Cammiss to my site today! Why not grab a glass of something and a slab of cake, and settle down for a read. Thank you for having me on your blog again – the first time was just after my debut novel was published in 2014. A lot has happened since then, but my writing story began a long time ago. It sounds like a cliché these days, but the old advice to write about what you know certainly worked for me. I was lucky in my working life; first in public libraries, which I absolutely loved, then into film archives. I spent seventeen years with Sky News, managing a team responsible for accumulating, cataloguing and maintaining a news footage archive. I’m not a journalist, and my background in libraries and archives presented an unconventional route into television. It was a great job, really interesting. 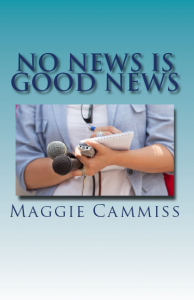 Working in rolling news was like being in a revolving door – there was always something going on, day and night – and it provided me with all the inspiration I needed for my first two novels, No News is Good News and Breaking News. There’s a romance at the heart of both novels, with the overheated environment of a television newsroom providing the setting. These novels aren’t specifically autobiographical but they probably reflect aspects of my younger self. The characters and storylines are entirely fictitious but that doesn’t stop old colleagues asking if they feature in them – I tell them I’ve changed the names to protect the guilty! No News is Good News was released in 2014 but the publisher had closed its list by the time Breaking News was ready. I tried assisted publishing, but this was a very disheartening experience, so eventually I decided to go it alone. I recently relaunched both titles independently, with brand new covers, and they are available on Amazon. I think they look fabulous and I’m very proud of my efforts. 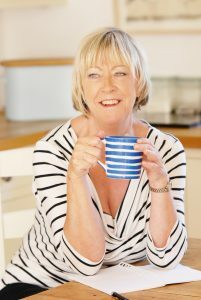 After writing two novels set in a working environment and featuring younger women, I needed a change of scenery and I also wanted to write about the experiences of women my own age. The current novel, working title, Serendipity, explores the relationships between four women, the secrets they keep from each other and the consequences of their silence. My new characters are older and hopefully wiser, and have their individual ways of dealing with some universal problems. There’s conflict and drama, a hint of romance and some wry comedy in the mix. I write a lot of short stories, too, mostly as homework for my writing group, and I’m often asked where I get my ideas from. I have to admit to being an inveterate people-watcher and eavesdropper – I suspect many writers are. I tell everyone who comes to my house to be careful what they say – it might end up in a novel. Snippets of conversation I’ve accidently overheard are like gold dust. One of my best ones was in a shop. Two people came round the shelves towards me, one of them saying to the other, ‘Oh no, it’s not for me, it’s for the private detective.’ I couldn’t wait to get out of the shop and write it down. As far as the writing itself goes, I’m more of a planner than a pantser – I like to know where I’m going. But when I have the basic outline I give my characters their head and follow where they lead. I’ve written myself into plenty of dead ends! The characters always know their own minds and often create problems I haven’t envisaged, but I’ve learned to wait; the solution will reveal itself in its own time – usually in the dead of night. Which is why I keep a notebook by the bed: to jot down those elusive thoughts that would otherwise vanish with the dawn. It helps me believe that I’m in control. I love making stuff up – constructing scenarios, fitting imaginary characters into them and engineering all their relationships. It’s like playing God. I don’t always like the isolation, or the detrimental effect that writing has on my bottom, but overall, it’s my dream job. Television producer Sara Cassidy has her life all mapped out. She loves her job making weekly feature programmes for TV news channel UK24, and is looking forward to furthering her ambitions in the media. She is devastated when her fiancé makes a shattering confession but she hardly has time to come to terms with the betrayal when her closest friend is involved in a freak accident and Sara’s world is turned upside down once again. As Sara struggles to maintain a professional perspective she finds solace in a new interest and a blossoming romance. But she has to be careful who she trusts in the cut-throat world of television news. Just as she is finding her feet again the career that means so much reveals its murkier side. When she suddenly finds herself at the other end of the camera lens, Sara discovers that in the struggle for ratings, loyalty is in short supply. A lovely visit, Jenny – thanks for having me, and for the cake!